A new report in Mother Jones finds that even if plastic bottles and food containers were rid of a notoriously dangerous additive called BPA, they would in many cases remain unsafe -- putting people at risk of breast cancer, prostate cancer, diabetes, obesity, heart disease and numerous other serious ailments. 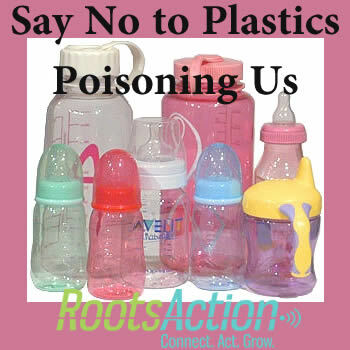 Estrogenic chemicals -- as dangerous as BPA and worse -- are used in plastics found in water bottles, baby bottles, and all kinds of food containers. The Environmental Protection Agency does not test or regulate these chemicals. Consumers have no way of knowing what's in a product by looking at it or by checking what type of plastic it is. This petition will be submitted to the Administrator of the U.S. Environmental Protection Agency. Democracy Now: Are Any Plastics Safe? We demand that the federal government serve its primary function of keeping us safe by ending the use of untested chemicals in our food and drink containers. Please add a comment if you have something to say. 23781 4.2 years ago Ellen Jamieson Leonia, NJ , US Also, ban the use of petrolium to make plastic. Less harmful alternatives do exist. 23771 4.5 years ago Tom Berti Pinehurst, ID , US It never seem's to amaze me as to how the love of money and power can harm so many people.